Floral patterns are all the rage right now. These are in all of our vacation plans...and we wear them every day. A Floral Skirt is an easy way to try the floral trend because there are so many different ways to style it. Find a print that fits your personal look and let the skirt take you all over town from running errands to PTA to dinner out and beyond. 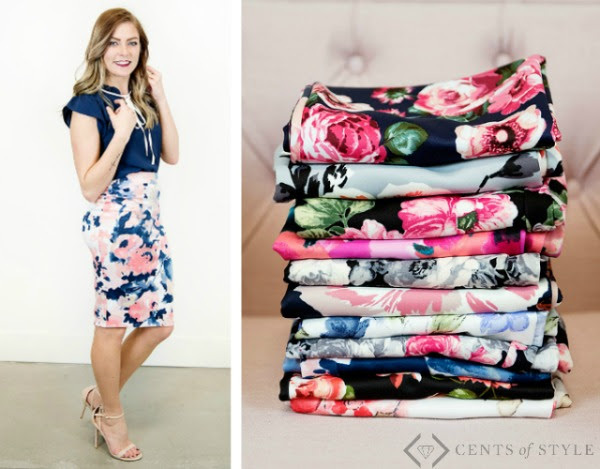 From ultra-soft and flowy to the perfect pencil, and sizes S - 3X, Cents of Style has multiple options in a variety of colors. Fashion Friday Story - Floral Skirts for $19.95! The code is FLORALSTORY and it will make each skirt $19.95 + FREE SHIPPING. The code is valid 2/17 through 2/19. Keep it casual with a graphic tee. It looks easy and effortless. Throw on a light layer. Don't be afraid to experiment with different styles and materials -- try duster, cocoon, and button down cardigan styles or leather and military jackets. The half tuck. Give an oversized sweater or shirt a little shape with the half tuck trick. Less formal than the full tuck, this look pairs especially well your fave pair of ankle boots and lunch with the girls. Dress it up. Trade in the ankle boots and the graphic t-shirt for some stilettoes and a blouse. With the top tucked in accenting your waist, you'll be all set for date night.